NOTE: The ‘Learn the WordPress Media Library’ video tutorial is currently undergoing updates. 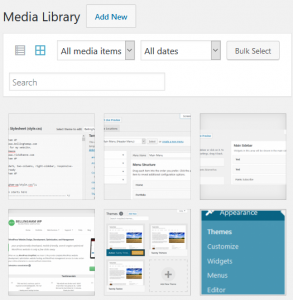 The WordPress Media Library acts as a central repository for all media which has been uploaded to your WordPress website. It allows users to upload, delete, edit, set options for, and view information about each specific piece of media. To add a new piece of media to the library, either click on the ‘Add New’ link within the Admin Menu under the Media Library section, or click the ‘Add New’ button at the very top of the media library page itself. Either option will present you with an ‘Upload New Media’ page which contains a dash-outlined box which features the text “Drop files here,” along with a ‘Select files’ button. Either drag and drop the new media into this area or use the Select Files button to browse your computer for the media files you wish to add. In addition to being able to add media directly through the media library, media can also be added via the ‘Add Media’ button above the WordPress editor for posts and pages.